Artist Class is on hiatus. Please follow this site to be alerted when the next session is scheduled. Many of the Artists who have produced tutorials for Artist Class teach in many other venues as well. I thought you might like to know about just some of the upcoming events. Lisa McIlvain will be teaching at Paper Cowgirl this June in Waxahachi, TX. One of her classes is full, so get into the other soon if you'll be attending. 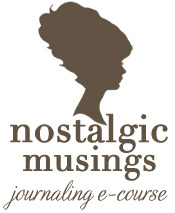 Hope Wallace Karney has started Nostalgic Musings, a new journaling e-course. Taking this is a great next step for February Artist Class participants who were lucky enough to get an early glimpse at some of the materials. Learn more HERE. Lilla LeVine will be teaching 4 classes in July at the International Quilt Festival, in Long Beach, CA. The dates are 23-25 July, Long Beach Convention Center. Some of our artists do small group classes, maybe near you. Nikki Mans does crafty classes the second Tuesday of every month at New Life Assembly church in Bridgeport, Nebraska from 6-8 pm. Those interested can check her blog for updates & details or email questions to whimsy-girl@hotmail.com. Nerissa Alford lives in Kuwait and is doing art classes and organizing art & craft shows. If you, your friends or family members are nearby, please contact Nerissa for a list of upcoming events. The Garden Party session of Artist Class is just around the corner! The first supply list posts on Friday, April 2nd, the first extra on Sunday April 4th and the first project, Monday April 5th. Whew! If you haven't seen the pictures and projects, they range from quick to complicated; just scroll down to read about each one. From the posts, you can follow links to the artist's blogs and shops, and learn more about them. Registration is open, just click HERE to sign up. Register for Artist Class Today! Registrations are open for the Garden Party session of Artist Class! Scroll down to read the posts below to learn about just some of the 12 projects that will be presented during the April session of Artist class. Watch this blog for updates as more projects are added. Pictured are just some of the fabulous projects presented in the Garden Party session of Artist Class. The first project tutorial posts on April 5th and registrations are open now! The Next Artist Class! With a Brand New Price! Did you know that April is National Garden Month? It's a great time to celebrate Springtime, Gardens, and the return of sunshine with the newest 4 week Artist Class session. This Garden Party session is filled with great Artists, charming projects and loads of extras - plenty of them designed to entice you into a springtime garden-fresh mood. Shake off the grey and throw open the windows, this is your time to push aside any lingering gloom...and bring your creativity to life. You'll pay just $39.00 for the entire session! Registration begins next Sunday, March 14th. The price of a session of Artist Class is normally $59.00, but Garden Party is just $49.00 - $10.00 off the original price. Then, with an Artist's discount code you'll save $10.00 more. You'll pay just $39.00 in all! Artist Class Garden Party is held from April 5th through May 1st. New projects post every Monday, Wednesday and Friday. Special daily extras will be available every morning; there's always something new. Ask past members - so much is offered that it can't be finished in 4 weeks! That's why every project is downloadable to be saved; and the blog is open for a full 6 months. There's plenty of time to play on YOUR schedule. Registration opens on Sunday, March 14th, the cost is $39.00 with a discount from an Artist Class artist discount. Watch this Artist Class blog for class and project details during the week of March 8- 15.